It’s the single most important room to start and end your day on a high note. When you’re in this room you look at yourself in the morning for the first time, and at the end of the day, you look at yourself for the last time. Improving the look, atmosphere and functionality of this room can have a great effect on your self-image and outlook. What room is this? It’s the bathroom! If you start and end your day in a tired, old, dysfunctional and run down bathroom with a drab, peeling paint job, a toilet that won’t stop running, sink and shower fixtures that are leaky and tarnished with age, you’re giving yourself a subtle negative message every day. On the other hand, if your bathroom is a bright, welcoming place with a touch of luxury, the sink, the shower, the toilet all beautiful and welcoming, you’re giving yourself a subtle, positive message every day. Get rid of that leaky faucet, and ugly vanity. Replace them with a new vanity cabinet with a nice finish. Add a stone or fabricated top to your liking. Install a brand new beautifully functioning faucet. It’s been called “the throne” for a reason. Bring it closer to its true identity. Consider that ugly pink toilet that’s been sitting there for 40 years. It can use up to 5-8 gallons of water per flush, and if it’s running it’s wasting a gallon an hour down the drain, taxing our resources and wasting your money. Swap out the old toilet with a beautiful new, efficient toilet that that won’t be continually running, and will only use 1.5 gallons per flush. Does you shower faucet leak? When you turn it off, does it still drip? As you lie in bed, can you hear that drip…you’re lying there waiting for the next drop to fall? Realize that this is an ancient evil practice called “water torture”. Don’t do it to yourself. Upgrade to a new, beautiful shower fixture. 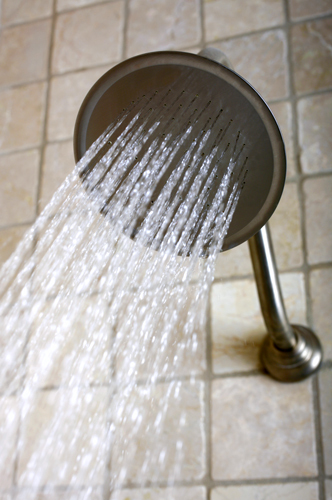 In addition to not dripping, you’ll be able to adjust the water flow better to give yourself an invigorating shower. What a way to start the day! So far, a few small adjustments have entirely upgraded your daily bathroom experience! But what if you want to go to the next level? Some people like a cold shower, maybe you don’t. Replace that old water heater with an efficient, energy-saving new water heater that heats the water more rapidly while saving you money every day in energy bills. We can even install a water heating system that heats the water right in the pipes, as needed so that you’ll never run out of hot water, and always only heat the water you’re actually using. Are the walls drab with that foil wall paper from the 70s? Are the tiles dark and moldy and some of them broken, missing or discolored? We’ll entirely reface your bathroom. We will protect your floors, remove your walls, bathroom floor and fixtures, bid them a fond farewell as we place them into a dumpster…and now the fun starts. We can now repair the rotten wood, replace that old plumbing and electrical, and begin to rebuild the space into a bathroom you’ll want to move into and never leave. Our team of licensed professionals will perform miracles replacing wall boards, tiles and fixtures…turning that old beat up bathroom into the showcase of your home. Using top quality materials from trusted brands like Kohler, American Standard, Toto and other quality manufacturers. Imagine starting and ending every day in the atmosphere of a beautiful, bright, inspiring, well-functioning bathroom! Aren’t you worth it? Please give us a call and we’ll look at your bathroom and give you some ideas of what’s easily possible.